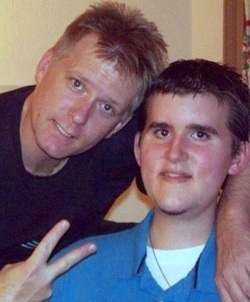 On Wednesday, November 27, 2013, at about 6:00 a.m., my son Ryan Allen Jeffress passed away in his sleep at his home in Nacogdoches, Texas, at the age of 20. He lived admirably with Duchenne muscular dystrophy, as his gentle spirit and sharp mind were immune to the ravages of this degenerative neuromuscular condition. He was the most humble person I have ever known. He always thought of others more than himself. I never heard him complain about his condition or the pain he experienced from it. He was a model of keeping a good attitude amidst adversity. He always had a great sense of humor and loved to laugh and make others laugh too. Ryan was diagnosed with DMD when he was six years old and was in a wheelchair by age eight. He served as a goodwill ambassador for the Muscular Dystrophy Association in Texas and Virginia and helped to raise thousands of dollars to fund research and send kids to MDA Summer Camp, which he dearly loved. He appeared on television twice during the MDA Jerry Lewis Telethon, and looked forward to MDA Summer Camp every year. I believe he would say it was his favorite week of each year. Ryan loved sports. He served as the team manager for various ball teams at his schools. When he appeared on stage with a local radio DJ host to introduce the Newsboys at a fundraising concert in 2003, the DJ asked him, "If we raise a lot of money that funds the research to find the cure and you can walk again, what do you want to do when you grow up?" Without hesitation, Ryan said, "To play quarterback for the Dallas Cowboys!" He was an avid Cowboys fan, and I am so grateful that I was able to take him to his first and last game at Texas Stadium on December 23, 2012. The Cowboys lost in overtime to the Saints, but it was a special trip, and I think we both knew it would be our last big hoorah. Fortunately, Ryan discovered the sport of power soccer in 2006 and enjoyed a few good years playing on a competitive sports team. His Tidewater Piranhas won second place in the first national tournament in which they competed in Indianapolis in 2007. Power soccer became such a blessing in his life and to our family, that I made it the subject of my doctoral research. Ryan graduated as a National Honors Society member from Nacogdoches High School in 2011. He was on the school newspaper and yearbook staff and was studying broadcast journalism at Stephen F. Austin State University before his health took a severe turn for the worse. Anyone who knew him can tell you that he was a walking encyclopedia of sports trivia. Ryan's faith was also important to him and he was an active leader in his youth groups at church. I wish that we had more time to share and do the things that fathers and sons all over the world take for granted. I deeply regret the times that I got impatient or showed too much emotion in front of him because I wanted to "fix" him and couldn't, but I know he understood that it all came from a place of love and pain from wanting to trade places with him. I am glad that his spirit has been set free and at peace knowing that he was tired, so tired, and is now at rest. Rest in peace, my son. I love you forever and always.